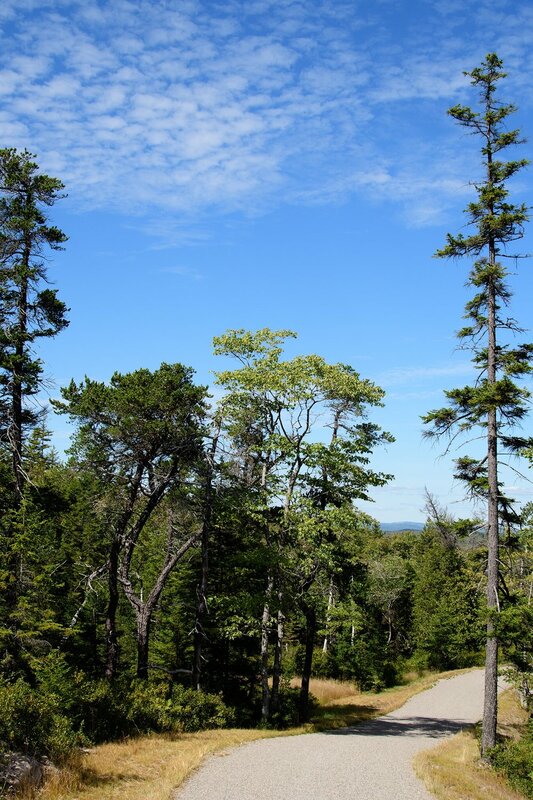 The National Park Service adds a campground, trails and vistor center to the Schoodic Peninsula in Acadia National Park, and it's a worthy 100th birthday present to all of us! About a year ago I went to Schoodic Penisula (see my trip report here: http://www.goseeittravel.com/travel-blog/2015/8/12/acadia-national-park-and-schoodic-penisula ) see note* and reported that the National Park Service was just about to complete Schoodic Woods, a new campground with hiking and biking trails in the Schoodic Penisula part of Acadai National Park, a quiet area across the Mount Dessert Narrows in Frenchmans Bay from the busier part of the park on Mount Desert Island. Luckily, for GSIT readers, this time, I brought along my dear husband, Jeff, who is a far better photographer! Here are our impressions of the new "gift" to all of us for the 100th birthday of the National Park Service and the 100th birthday of Acadia National Park. *Note: in my 2015 report, I review a restaurant called Chester Pikes, I paid another visit this year and while it retains the same name, I learned it's under new ownership. There were fewer local cars in the parking lot, only one kind of pie in the pastry case and the menu seemed to be limited to primarily breakfast items. I'll be looking for some new places to fuel up in the future! 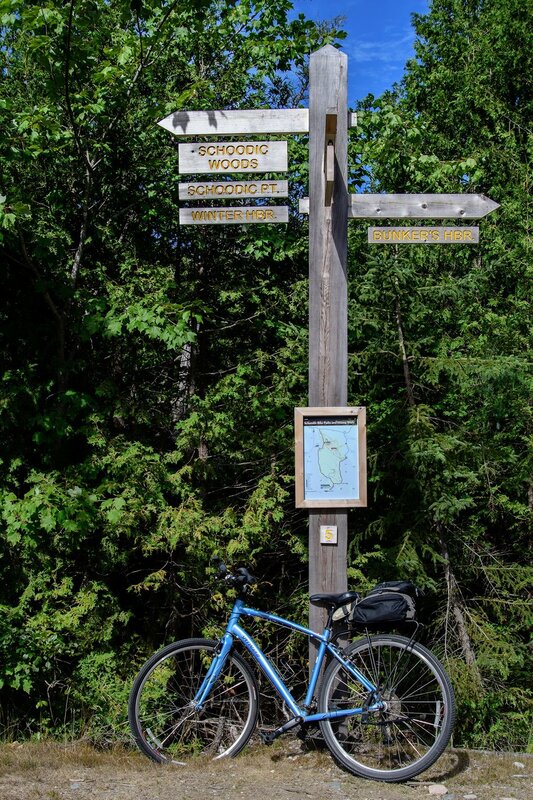 The wide gravel trails are pretty level with the exception of the climb up Birch Harbor Mountain and a few hilly curves headed toward the ocean. On a beautiful September Saturday we hit the new trails of the Schoodic Trail System. Our first stop was the new parking area near the Winter Harbor entrance. The parking lot is well laid out with plenty of handicapped parking, and no-backing-out areas for larger rigs. We visited the homey looking restrooms (what a nice touch putting screen doors on the restrooms!) with a separate family rest room to avoid any gender bender issues that come with the different family constellations who make up our great country! There is a water fountain with a bottle filler and even a dog water spot! The granite paved plaza includes a bus shelter- LLBean funds an extensive network of propane buses called the Island Explorer that can carry people and bikes, all around the National Park Areas (see the website here: http://www.exploreacadia.com ) There is also a new Vistors Center with a large relief map of the Schoodic Penisula and Park Rangers available to answer questions. A map of the new bike and hiking trails and the connections to the old paved two lane one way multi use route can be purchased or seen here ( https://www.nps.gov/acad/planyourvisit/upload/Schoodic-Trails-map.pdf ) We found the signage excellent at each intersection, and it might not be neccesary to buy one. The campground is just beyond the vistor center, and while we didn't stay there, I interviewed a couple who were among the first folks stay there in their old silver airstream trailer, last year after its soft opening and said it is spectacular, and they were back for more this year! We were at the park to try out the new trails on our bikes. We've biked this part of the park in the past, but the 2 lane, one way only, paved mixed car/bike road always required cycling a few miles on public roads to return to the small, overcrowded parking lot. The new trails link a new huge parking lot, the campground and vistor center to the existing one way car/bike loop, allowing families to bike without having to be on busy public roads at all. The new trails are packed with loose gravel on top. We found our hybrid bikes with fatter tires handled it well, but a road bike would be tough to manage. Also, some trails feature steep inclines and declines, that are well marked but may need to be approached cautiously by small children or folks with less biking experience. Because they are mixed use trails (bikes and hikers) there is no shame in dismounting and walking the steepest sections to be safe. We took the road less traveled, a rather steep switch back trail up Birch Harbor Mountain and looped back up to the beginning of the one way paved road at Frazier Point. But it's also easy to cycle easier trails right to the level paved one way road and go back on the gentle, level, gravel trails at the end of the one way section to get back to the parking lot. The gravel trails give a good view of the woodlands of Maine and blueberry land. Bring along a little plastic bag or containor in early August to pick a few wild Maine blueberries during a break! Once on the paved road, the ocean is the star attraction, in constant view along the right hand side of the road. We glided along the trail with views of lighthouses, rocky surf, islands and boats. We could see the mountains of Acadia National Park on MDI across the Mount Dessert Narrows. One of my favorite stops (just past the light house) is stone pier built up by the pounding waves of the Atlantic Ocean. 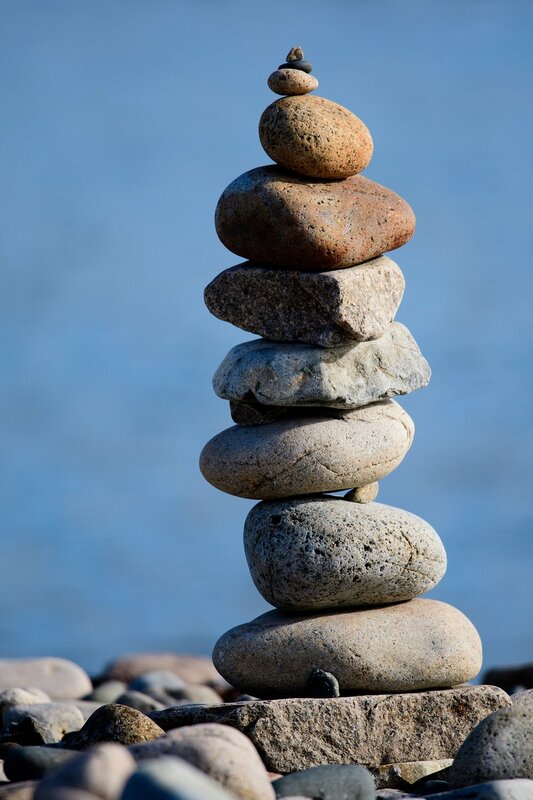 The stones are pounded smooth and the pile has become a natural pier several feet above the ocean. The stones are fascinating to pick through, admiring the smoothness, and variety of shapes and colors. I love the way they squeak when you walk along the top of the pier. 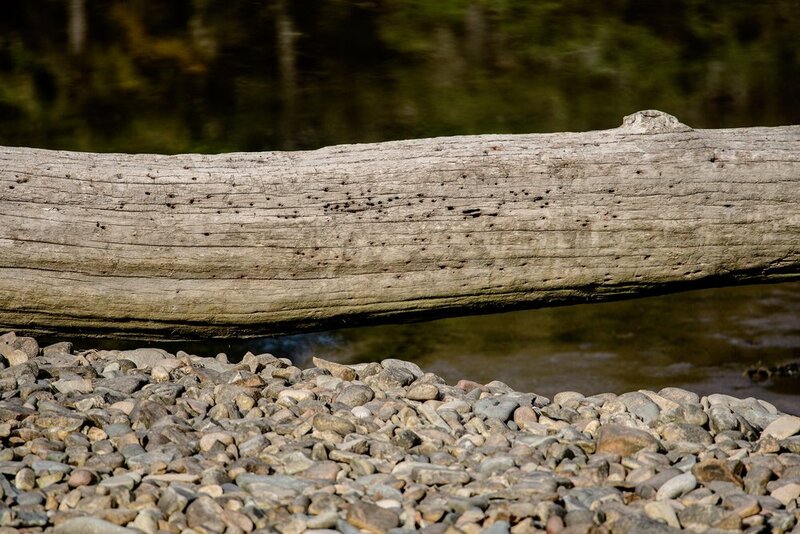 As tempting as it may be, stones should only be enjoyed in the moment; its illegal to remove anything from the National Parks! A huge pile of smooth stones are fascinating to examine in detail. This area includes many spots to pull over and enjoy scenic overlooks. You can bring camp chairs or just settle on a boulder and enjoy the rocky coast and ocean views anywhere along the route. You'll likely be all by yourself! Interviews with other visitors led to the same consensus; they enjoyed this part of Acadia because it was always so much quieter, and less developed than the other more popular parts of the park on Mount Dessert Island. A lone sail boat moored in Schoodic Harbor. We made another stop at Schoodic Point. This bold granite outcropping jutting into the ocean often features dramatic waves crashing against the rocks. Care should be taken wandering on the rocks, as the waves can be unpredictable, especially during rough weather. On the two way road out to the point, there is the Schoodic Education and Research Center. This is a stop well worth making. The building itself is a fascinating piece of historical architecture to see and inside the building is an interpretive eductional display, with lots of hands on activities for the kids and a small gift shop. Schoodic Point, with dramatic waves crashing against the granite outcroppings. We turned left onto the gravel paths where the one way paved road ended and headed back up to the Schoodic Woods visitor center and parking lot. Our ride was about 10-12 miles, but a shorter route could be planned easily. We enjoyed our visit to the new trails and facilities at the Schoodic Peninsula. We've always enjoyed Acadia National Park, but we really loved this new gift to visitors of Schoodic Peninsula for the 100th birthday of our National Parks! It's a beautiful addition, and we hope you get to "go see it", even though the families we interviewed begged us not to tell anyone else about this beautiful, remote part of Acadia National Park! But we had to share it, think of it as our gift to you!